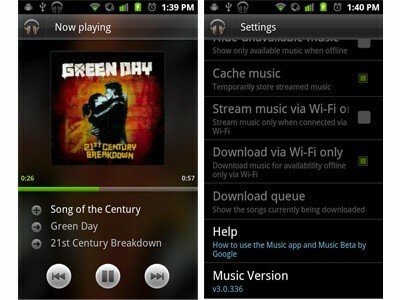 Wondering what Google's answer to Amazon's cloud music player for Android will look like? Then it would seem you now have your answer --the Tech From 10 website somehow managed to receive a developer version of the Android Market, which allowed it to download Android Music 3.0 and try it out for themselves. That site's unfortunately down at the moment (along with the download of the app itself that it was providing), but it doesn't look like there's too many surprises to be found. Things are almost identical to the existing Android Music player in terms of appearance, while the settings menu has expectedly been augmented with various streaming-related options. Android Market itself has also apparently been tweaked slightly, and the developer version included a few other surprises as well, including new camera and desk clock apps. Unfortunately, we haven't yet been able to try it out ourselves, but you can keep an eye on the source link below for the downloads to return. Droid Life is also hosting some downloads of its own. You can find them here.